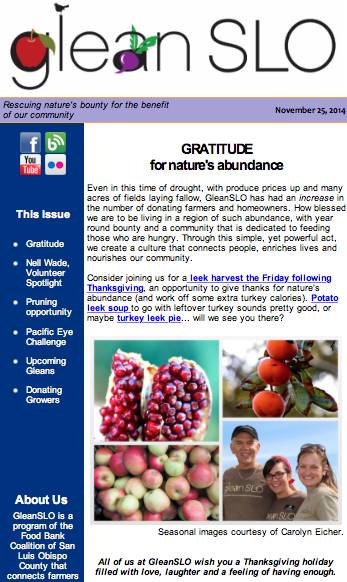 Enjoy our November 2014 edition! 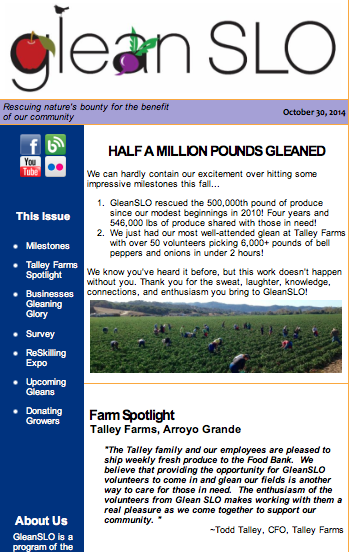 This entry was posted in Archived Newsletters on 11/26/2014 by gleanslo. Enjoy our October 2014 edition! Meet Nell Wade, a gleaner with vision! Nell Wade joined the GleanSLO Steering Committee this year and we are so happy she did! Nell is a woman of many talents and offers her expertise, enthusiasm and passion for gleaning and giving back to the community. 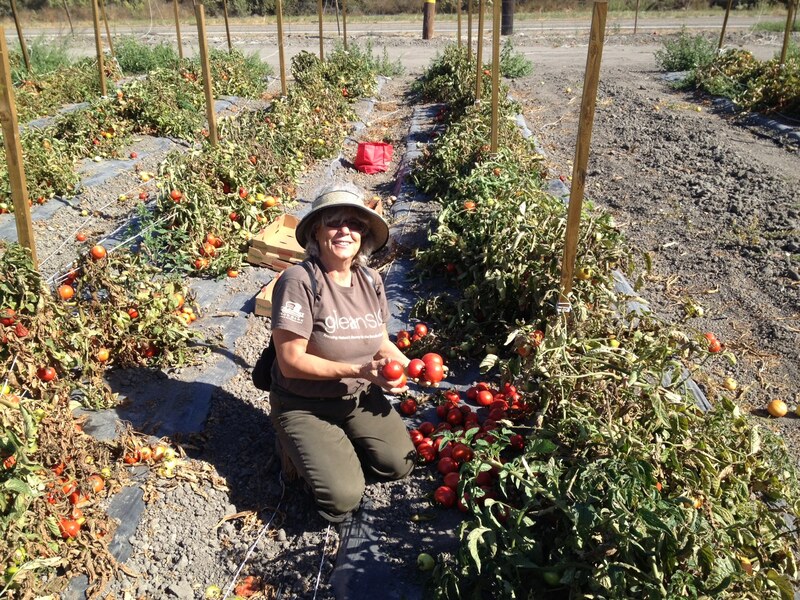 Nell spends her time involved with many local groups – she is a VP for Master Gardeners, a local group of Seed Savers, and is involved with helping revitalize the SLO Grange. Additionally, she is a member of Slow Money, the Food System Coalition and the local chapter of CRFG (California Rare Fruit Growers) where she is the Market manager for the free Annual Scion Exchange at Cal Poly in February (3rd Saturday). At this event Nell wants to share that homeowners can learn to graft fruit trees and items such as root stock are sold. Nell brings so much wisdom and experience to our committee and is helping us expand the vision of gleaning for our county. Nell harvesting thousands of pounds of tomatoes for the Food Bank. This entry was posted in GleanSLO Interviews on 11/25/2014 by gleanslo.